SCOTTSDALE, Ariz. – Nov. 17, 2015 – Barrett-Jackson, The World’s Greatest Collector Car Auctions®, will host a nine-day celebration of the company’s 45th anniversary in Scottsdale, Ariz., from Jan. 23-31, 2016, at WestWorld of Scottsdale. As the barometer of the collector car market in 2016, Barrett-Jackson is filling its docket with more than 1,500 rare and collectible vehicles. 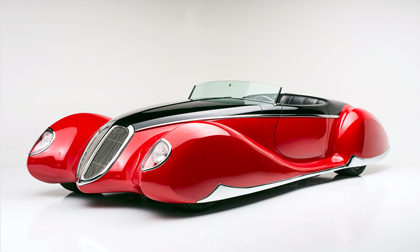 Two exceptional collectibles crossing the block include a 1939 Mercedes-Benz 540Kand Boyd Coddington’s“The French Connection,” a 1938 Lincoln Coddington V12 HEMI. The 45th Anniversary Scottsdale Auction will include a host of exciting activities, events and exhibits over the week. Kicking off the week will be the Cox Family Value Day on Saturday, January 23, with free admission for children under 12. The Opening Night Gala, a renowned event held at each of Barrett-Jackson’s four annual auctions, will be on the evening of the 23rd. Registered bidders, consignors and sponsors receive invitations to the gala. Throughout the nine-day auction, fans can participate in the Ride ’N Drives and Thrill Rides with Ford, Chevrolet and Dodge, as well asshop the vendor marketplace and enjoy live music on select evenings. New to the 45th Anniversary Scottsdale Auction will be the Experts’ Symposiums held early in the week. Here, enthusiasts can get an idea about what to look for when buying a car and hear from Barrett-Jackson’s team of experts. This team works at each event to help review certain high-end and rare cars that may be represented, by the consignor, as having matching numbers or documented with show provenance. The symposium schedule will be announced and available online as the auction approaches. “This 45th anniversary celebration will represent the ultimate automotive lifestyle experience and the most incredible environment of its kind,” said Steve Davis, president of Barrett-Jackson. “The amazing docket we are building for the 45th anniversary will be a milestone in Barrett-Jackson history.”Representing the prewar cars that Barrett-Jackson began selling 45 years ago, a pristine 1939 Mercedes-Benz 540K Cabriolet A will be one of the featured consignments in Scottsdale. This vehicle was originally delivered to German field marshal Erhard Milch in 1939 before going to an unknown owner in Switzerland following World War II. Following a complete restoration in 1982, the vehicle has spent most of its time in museums. The body, frame, driveline and supercharger are all original to the car and it has taken home multiple prestigious awards, including Most Significant Mercedes-Benz at the 2008 Meadow Brook Concoursd’Elegance, Mercedes-Benz Star of Excellence at the 2009 Amelia Island Concours and Best in Class, European Class Pre-War at the 2011 Amelia Island Concours. Also featured on the docket for Barrett-Jackson’s 45th Anniversary Scottsdale Auction is the coveted 1938 Lincoln Coddington V12 HEMI, “The French Connection.”Representing a modern day interpretation of the prewar cars that Barrett-Jackson was built on, this one-off, custom-made car looks similar to a 1937 Delahaye and was Boyd Coddington’s last build before he passed away. Atop a custom, one-off Art Morrison chassis, this vehicle boasts a powerful 12.8-liter, all-aluminum HEMI-headed V12 BPM motor and a custom-built Turbo 400 transmission. It also features a custom Ford nine-inch rear end, coilover suspension and one-off Boyd Coddington wheels. The body is hand-formed aluminum by Marcel and the upholstery boasts luxurious ostrich leather. As this car is Boyd’s last vision for a car – his final ride – it comes with a Letter of Authenticity from his wife, Jo Coddington.